This outstanding outfitter who has been producing monster whitetail bucks for his clients over the last few years that no other free-range whitetail outfitter in all of North America can even come close to. Most hunters don’t really think of British Columbia as a location for producing big whitetails, so this outfitter remains one of the best kept secrets in the white-tail world. There is only a small area of British Columbia with the genetics that produce the really giant whitetails the Peace River country is known for. For the past 20 years or so, the hunting areas in the Peace River Region have been owned by foreign investors and no commercial hunting has taken place. The hunting areas are located in the South Peace Region of northeast B.C, which is some of the better big game habitat in North America. The area runs from the Alberta border southwest of Chetwynd, British Columbia. The hunt areas includes approximately 3,600 square miles of hunting territory and includes Management Units 720, 721, 722, 732, and 733. This expansive area of thousands and thousands of acres is the key to this outfitters success rate and the harvesting of exceptional trophies year after year. With this much territory available, the outfitter is able to implement strict harvest management goals that will ensure the area is not over hunted. The terrain varies greatly from high glacial mountains, valleys and river systems down to the foothills and farmland. The outfitter’s clients take some 200-inch class whitetails, muleys and impressive elk, goat and moose as well. Elk and moose hunts take place in Sept and October. Bulls of both species are vocal then, subject to calling and you can hunt with a rifle during the rut, something that is tough to find in the Lower 48. Hot, love-sick bulls respond very well to calling during the peak of the rut. This hunt allows you to do that! ELK: This outfitter’s clients average 95% on opportunity on bulls in the 300- to 350- inch range. During a typical year, a half dozen clients will harvest bull elk in the 320- to 345 inch range. The 7-day bugle hunts in September target screaming bulls as the cover is very thick and calling is the only way to get them into range. The season opens September 1st and goes to October 31st. Hunts take place the first three weeks of September when the rut is peaking and the last week of October when they start visiting the hay fields. The outfitter offers clients the option of trophy fees on other animals. They have to purchase the appropriate tags ahead of time, but if they are hunting for elk and run into a moose and shoot it, he charges $4000, or $3000 for a whitetail. Black Bear are $1000. No trophy free on wolves. All hunts are done via horseback, jet boat or ATV. Wall tent accommodations and 1 x 1 guiding. We also have a meat cutter and cooler and freezers available. MOOSE: Success on 45- to 55-inch bull moose is exceptionally high and there’s a chance to tag a 60-inch behemoth. The outfitter hunts in the famed Peace River area. The outfitter employs horses and river boats to reach remote, undisturbed areas. Two hunters per camp. Hunting coincides with the rut, so bulls respond well to calling. The outfitter is constantly on the lookout for new territory. Just a couple seasons ago while scouting a new valley they heard a moose grunt, walked in and came upon ten big bulls together. They shot one, and when they went to get the horses, two even bigger bulls showed up to mate with the horses coming within ten yards! 2012 note from outfitter: We have some great Canadian Moose hunting here as well. This is something that we have been working hard on to market over the last few years. It takes extensive scouting and trail cutting to get into this great moose country, and each year we are a getting deeper into this country. We can do moose hunts in August with archery or rifle, and by hunting over natural mineral licks. The regulation at this time of year is any bull –no point restrictions- good for bow hunters too. September 1st the season changes to three on the brow or ten points on one side. Hunting moose in the later part of September and up to the 15 of October requires calling as the moose are in full rut. I sent a guide and hunter into a valley 2 years ago (2010) to check it out, the next day they heard a bull grunting, so they snuck down in there to find out they were right in the middle of 12 different bulls fighting over territory, when you hit it right it can be incredible. The moose here generally go between 45 to 55 inches they are good heavy bulls with great tine length. All hunts are done via horseback, jetboat or atv. Wall-tent accommodations with a 1 x 1 guide ratio. Getting farther into some of this untouched area we are likely sooner or later to get into some monster bulls. The outfitter has guided has guided clients to four whitetails in recent years that have scored over 200-inches B&C. Bucks of that quality are not behind every tree, but there are present and available for the persistent, patient and lucky. 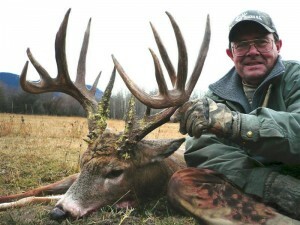 This is probably the hottest giant whitetail hunt that we know of anywhere, but the hunting is very weather dependant. No guarantees of course when you won’t settle for anything less than a 160-inch trophy, but he does have access to some great bucks. Call and talk to us. The outfitter recently expanded their hunting area in British Columbia for whitetail and mule deer by more than a whopping 1,100 square miles. These hunts are very specific to a small area in the Peace River region of British Columbia. With exclusive guiding access to about 4,000 square miles of land, they have regularly produced whitetails measuring from 160- to 180-icnhes or better. With the additional acreage, their area covers nearly 5,000 square miles, roughly from the Peace River, south to Chetwynd and east to the Alberta border. That’s larger than some US states! Many clients are repeat clients, who actually will pass on 150- to 160-class bucks, which is what this outfitter wants. This drops their success rate to around 50%, but this outfitter is working at producing 160-inch deer and better. How many outfits can boast 50% on 160 and better free range?? Just do not book this if you must take a deer home!! Supplemental feeding has helped prevent the major winter losses experienced elsewhere in this area. It’s expensive, but after half a dozen years or so, it’s beginning to pay off in huge trophies. All hunting is done from stands, and you can expect sub-zero temperatures and snow sometime during the three hunts they offer in November. As you would expect, this outfitter thrives on repeat clients, so you should have us contact them well in advance when you’d want to hunt to experience one of the best free-range white-tail or mule deer hunts in North America. With very limited openings available, please give us a call right away to see if we can fit you in, or get you on the waiting list for future years of hunting these great bucks. Outfitter: We have probably the most unique country for Mountain Goats from the high mountains to the lower foothill country which surround the many river systems that run through our hunting areas. I have never seen goats live in this kind of low land country except for here, and therefore it makes it ideal country to harvest a goat for the older age client. This past summer the government along with us did a goat count with the use of a helicopter, the numbers when all was taken into effect was approximately 600 head of goats, this number exceeds our expectations and we where very happy, as now we have a increase in goat permits to five per year instead of two. Goats in this part of the world have impressive genetics with horns featuring lots of mass and length and many goats making Boone & Crockett. The outfitter had two goats in the last five years win the buckle (biggest goat killed in Northern BC) at the Guide Outfitter Awards banquet, plus many other goats taking the second and third trophies. Classic spot and stalk type hunting, and usually about 2 hours on horseback in to the camp, spike out, and expect to be into goats the next day. Last year one guy woke up, they walked over to the hill, looked down and saw 16 billies! A fast hunt. .
British Columbia is known for its outstanding bears and numbers of bears. Classic spot and stalk bear hunting at its finest; hunting from the middle of May to the season ender of June 15 we truly take and see some incredible bears. Hunting methods are done by traveling (vehicle & atv) in the high mountain areas to the lower foothills country that borders the many watersheds including the Peace, Murray, Pine, and Sukunka rivers. We generally hunt in the evenings, as that is the best time to spot bears and hunting during the rut offers the best odds of really killing a huge boar. We have been using predator calls for the last 7 years and they offer a great opportunity and a very exciting experience. We are on a three bear a year quota on Grizzly Bear and Black Bears are unlimited. We suggest buying a wolf tag as well, as many are spotted during the spring hunts. Awesome easy hunt with great results in some very beautiful country. Dates may vary slightly for 2015! HST tax of 6%. This will also apply to license and tags. Black Bear Tag- $225; Grizzly Tag $1,175; Elk Tag $300; Moose Tag $300; Whitetail Tag $150; MD Tag $150; Wolf Tag $50. ATTENTION GUN HUNTERS: BOWS AND GUNS: You are allowed to bring your personal firearms with you. This includes your rifles and/or shotguns. For your firearms, a simple one-page form is required to be filled out to obtain a temporary Canadian Firearms permit. This form (CAFC 909) can be down-loaded or mailed to you well in advance from THE CANADIAN FIREARMS CENTRE at www.cfc-cafc.gc.ca click on the link on the left hand side for visitors/non residents, then download the NON RESIDENT FIREARM DECLARATION (form CAFC 909). Completing this in advance should reduce your time clearing customs. WE at BMOA can help you complete it. Do not sign it until you appear in front of Customs- but fill it out. A confirmed declaration costs a flat fee of $25, regardless of the number of firearms listed on it. It is only valid for the person who signs it and for those firearms listed on the declaration. It is a simple form to fill out. IF YOU HAVE A DUI OR A CRIMINAL RECORD- CALL US! You may be denied admittance with a firearm. All Arrivals and Departures will be in and out of Fort St. John, B.C. Transportation from the hotel to your hunting area is included, however if you must make an unscheduled arrival or departure there will be a fee of $200.00 per person. Elk are hunted in the Peace River area of BC. For the Elk hunting he will normally have two hunters per camp and these hunts are done by horseback or riverboat.